A Pair of Flights Today - - PAGE 443. A Pair of Flights Today · · PAGE 443. 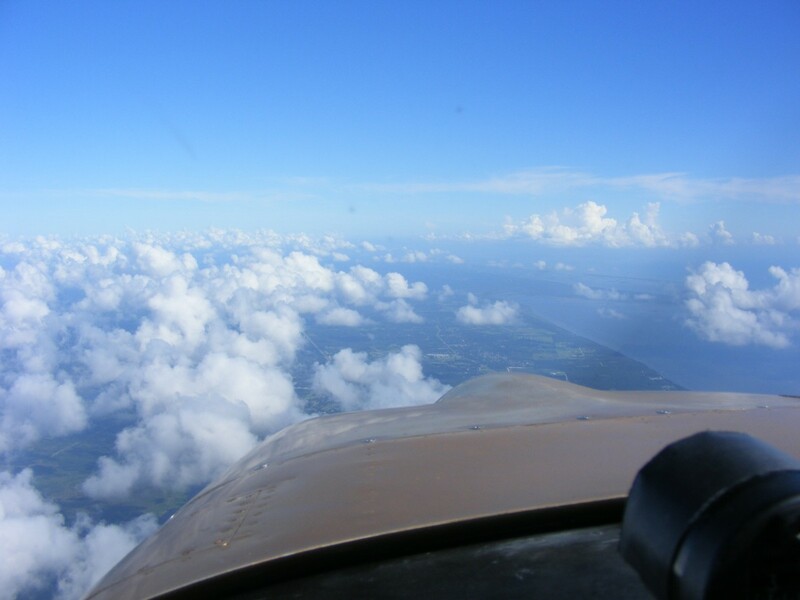 August 4, 2018: I made a local photo flight again over Palm Bay and a Fuel run to Umatilla. 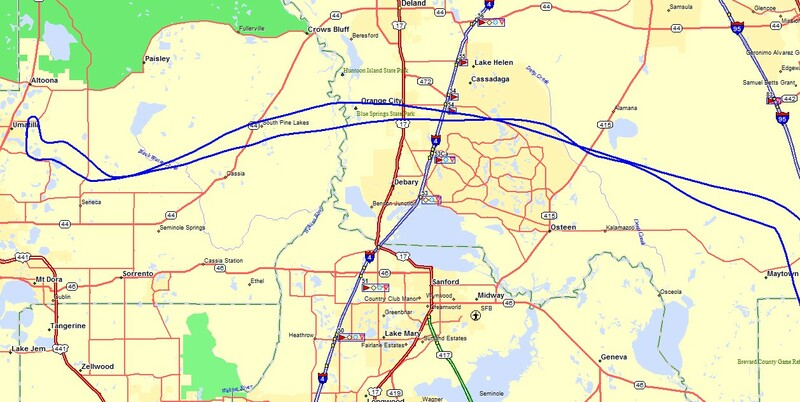 I used the GPS files to get the flight duration for both flights with the return flight from Umatilla to Rockledge as the second flight. 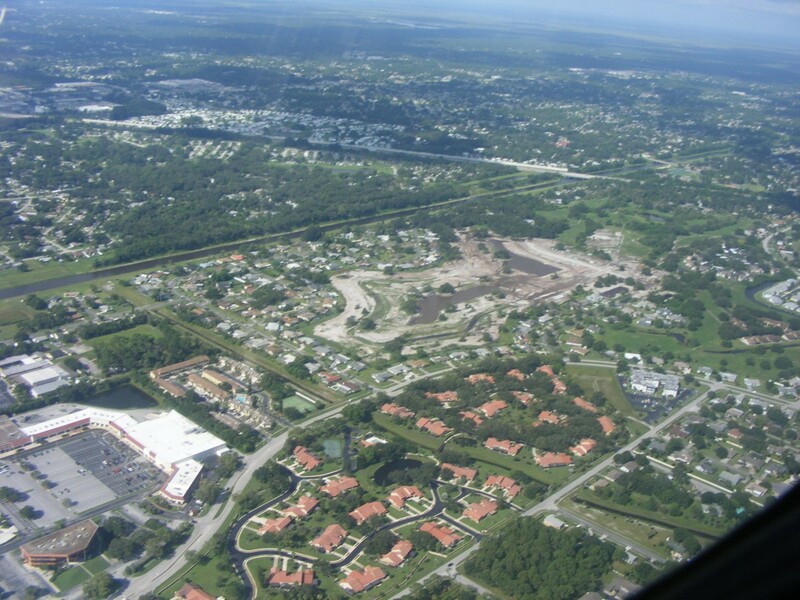 Here is the view of the project and the surrounding neighborhoods. Shot number two is closer to the old golf course showing phase 1 and 2 of the project. The last of three photos at a closer location on the flight path on the north side of the project. My aim was a bit off, but it does show the position relative to Interstate 95 and Melbourne Tillman Canal. This is the usual flight path near my home to get photos of the housing project on the old golf course. I departed the photo area and headed north following the Indian River. That is downtown Melbourne down there at the bottom right corner of the photo. The MLB airport is center right of the photo. I got a better photo of the Melbourne Airport (MLB) as I passed by at about 3,600 feet MSL. The main runway is over 10,180 feet long. 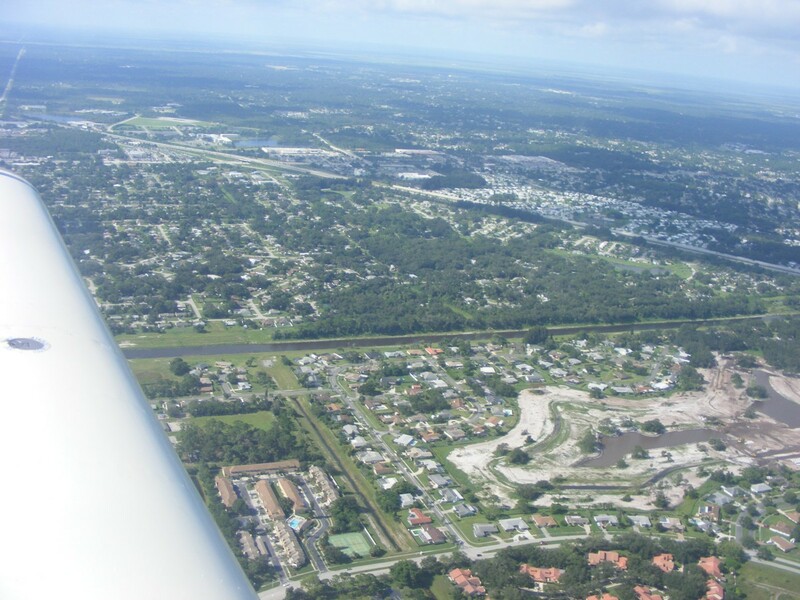 The path ahead shows the mainland at the far LEFT of the image, the THIN south end of Merritt Island in the center and the Atlantic Ocean beaches at the far RIGHT side of the photo. 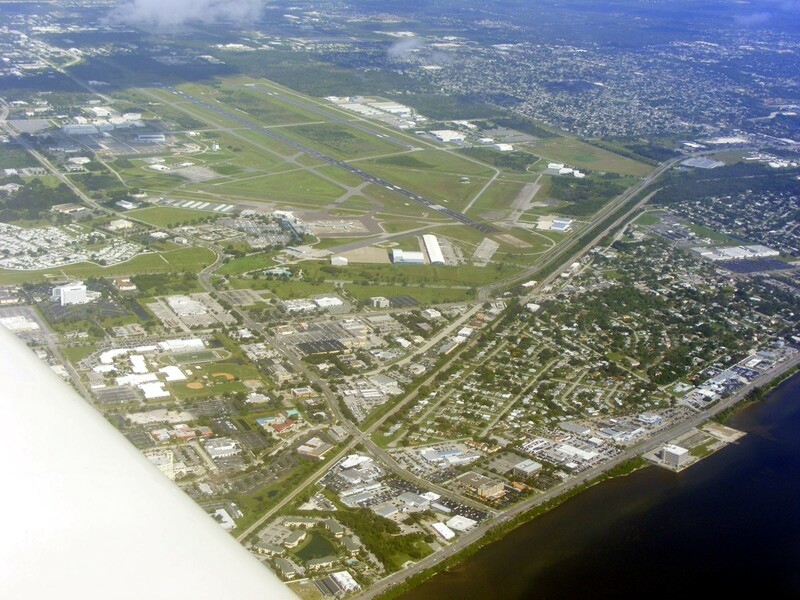 That barrier island has the towns of Indian Harbor Beach and Satellite Beach just over the nose, and Patrick Air Force Base at the point where the island comes down to a narrow strip of land with Florida Route A1A. That is the coastal highway along the Atlantic Ocean in multiple segments from Miami to Jacksonville, and a segment at Fernandina Beach just south of the Saint Mary's River at the Georgia / Florida state line. 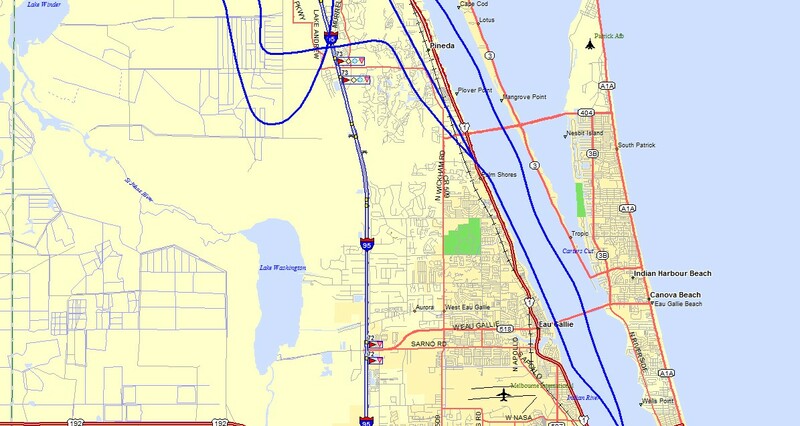 There are two causeways visible from US 1 on the mainland to A1A at the ocean. 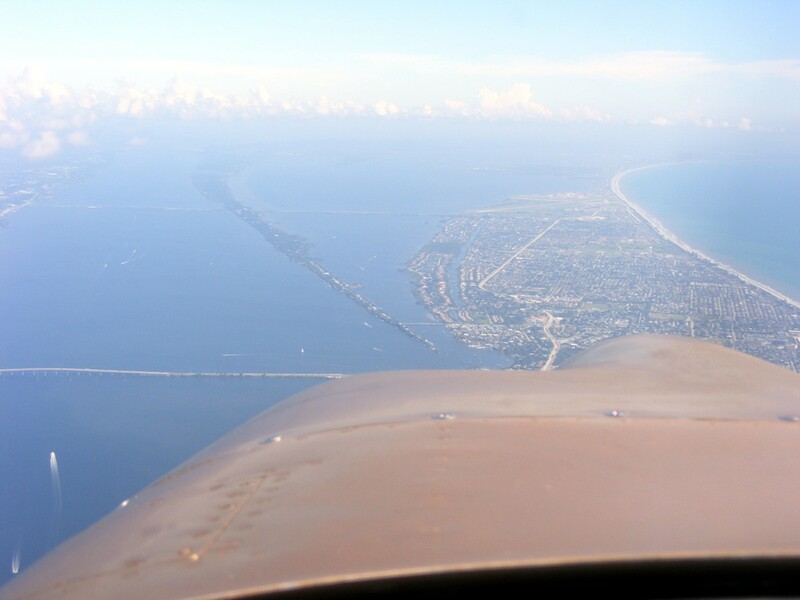 The close one is the Eau Gallie causeway with the Pineda Causeway crossing to the south side of Patrick Air Force Base barely visible through the haze at the middle of the photo. The bottom left corner of the photo shows several boats enjoying this good weather today. Here is the map to go with the photo above. 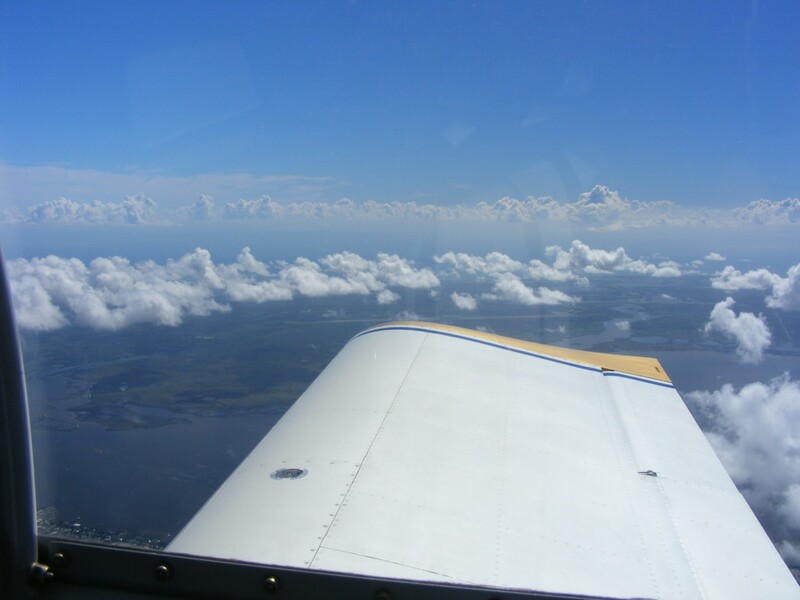 This photo was taken over the mainland up near the north end of the Indian River Lagoon. As I was approaching my left turn at OAKIE intersection, I noticed the rising cumulus clouds are in waves with these gaps between them. I saw a southbound airplane down around 2,000 feet just after I took this photo. 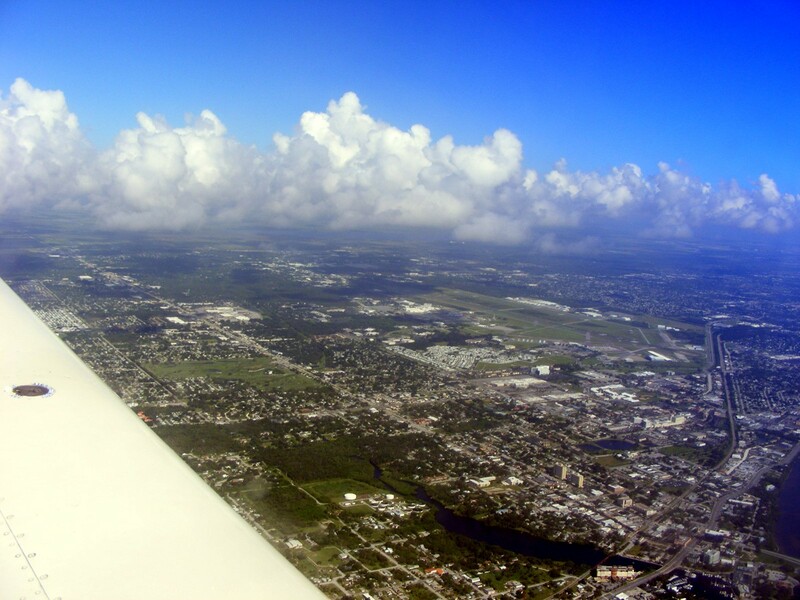 This is looking north as I fly toward the west on the north side of the Orlando Class B airspace and the Class C around the Sanford Airport (SFB). 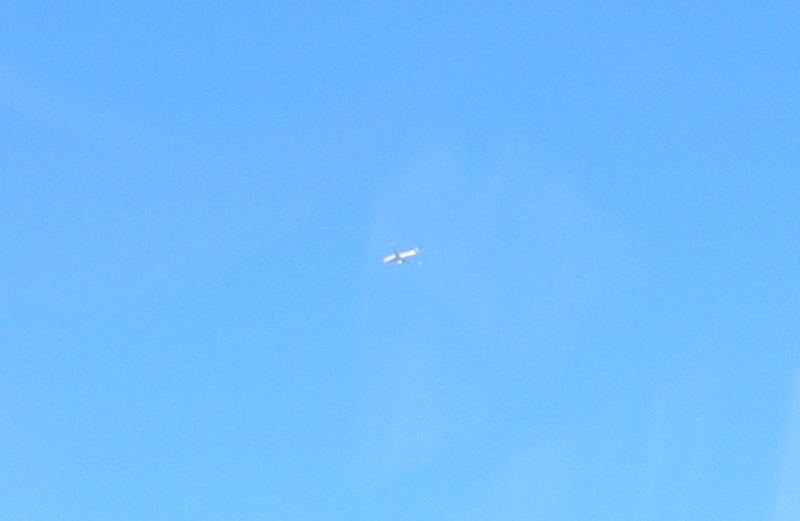 I looked up to see a Boeing 737 up around 10,000 feet and did not have my camera ready until it was south of my position a few miles. You can see the winglets. It was a good day for flying. 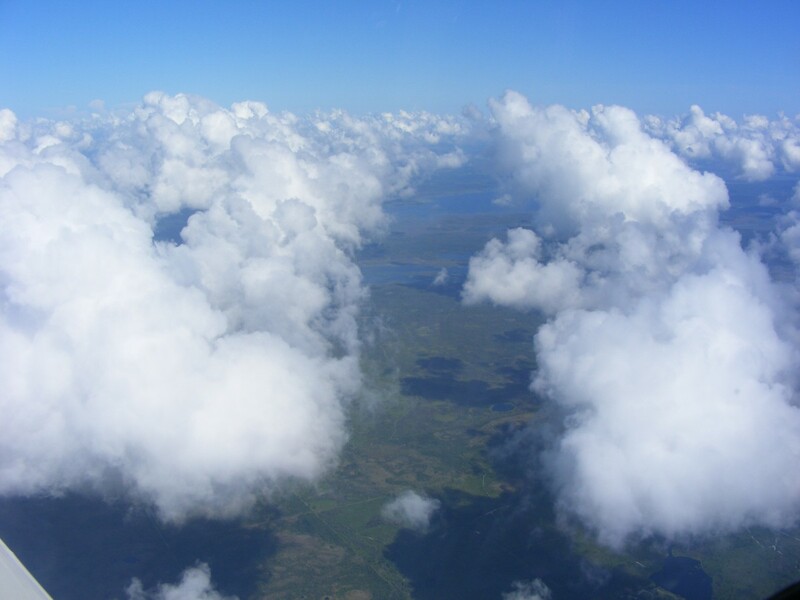 The weather above 6,500 feet was severe clear as you can see in the photo above. The surface winds at Umatilla were light to variable from the East. 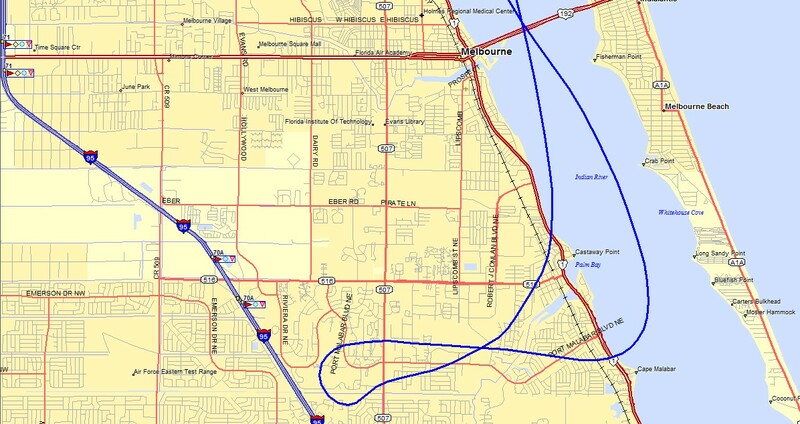 The usual path across this part of Florida clear of all controlled air space. No aerial photos on the way home. 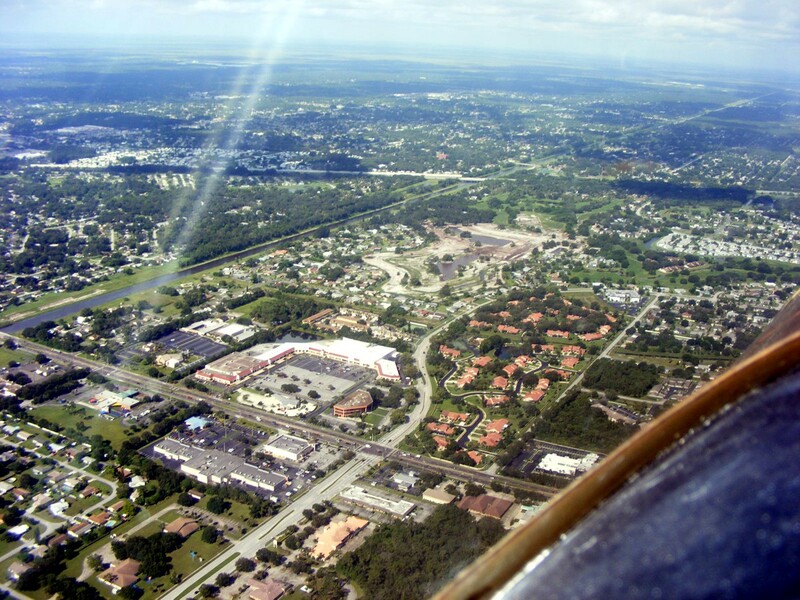 The cross wind at 500 feet on approach to Rockledge was about 15 MPH and lower down low on final to touch down on runway 36. The total flight time today was 2.1 hours added to the Hobbs meter now showing 423.7 hours total time.